"This is just like a horror movie." Here's a slightly unusual Hurricane Katrina-based documentary. Made in 2006 on a shoestring, this one doesn't attack the government or President Bush or Mayor Nagin or race relations or actually blame anyone but Mother Nature. In fact it doesn't really blame Mother Nature all that much either, as the hurricane itself almost becomes an afterthought for filmmaker Courtney Fathom Sell. Shot on a handheld Hi-8 camera for a budget of $250 (which included airfare) when Fathom Sell was 20, No Place Like Home represents a microcosm of the whole tragedy, focusing on his friend: designer/artist/musician Jac Currie. The laid-back Currie�an affable, smiling twenty-something�is our host for the 50-minute doc, beginning with a walking tour of an eerie post-Hurricane abandoned New Orleans. We then see the exploded remnants of Currie's family home in Mississippi, as he leads us through the wreckage, occasionally picking up an item or discussing what was where, pre-hurricane. Fathom Sell then sort of shifts gears, as the locale switches to New York City, as the relocated Currie�a struggling designer of a clothing line called Defend New Orleans since 2003 (which features a nifty mohawked skull above an oldtime rifle) �suddenly finds that his designs have taken on an entirely new meaning in the wake of Katrina. Originally started as a "celebration of cultural pride and preservation" years earlier, the Defend New Orleans moniker�led by that mohawked skull and rifle�quickly became Currie's cause celeb as it reflected the rebuilding process, and more importantly the desire for the return of the old New Orleans, in terms of music, art and culture. The look and design caught on, and Currie found himself at the forefront of a movement he didn't even really know he started. Fathom Sell follows Currie as his guerilla tactics include slapping Defend New Orleans sticker all over New York City, to his cramped apartment where he checks email orders and creates each T-shirt, as well as a few dullard conversations with his hipster friends, all of whom take the use of the word "like" to annoying levels of overuse. But when it's all about Currie things are good. He roams the streets, dodges crows, finds the floor of his family home 3/4 of a mile away from the rest of the wreckage, all with the same degree of easy-going unflappableness. Fathom Sell lets his subject go on and on, and the discordant range of content is tolerable just because Currie seems like a decent chap. So what if he doesn't always have relevant facts at times, or that he seems to bound along on a seemingly directionless path, making T-shirts and his own stab at making a pronounced social impact on things. No Place Like Home became something of an indie film fest darling, and the exposure has no doubt helped give the Defend New Orleans project a shot in the arm. Courtney Fathom Sell may just have been 20 when he shot his friend walking and talking, but the doc itself moves with a very relaxed flow. The use of some of the filmmaker's musician friends (none of which get any measure of proper credit) really enhance the local flavor, and lend the right kind of underground cool to it all. Image Transfer Review: No Place Like Home is presented in its original 1.33:1 fullframe. Shot entirely on a handheld Hi-8 camera for a budget of $250, there's clearly little room for polish, so those expecting a glossy travelogue on their big plasma sets will be nonplussed. This is clearly the definition of an indie production, and the black-and-white transfer, while soft and periodically suffering from fuzzy edges or white bloom, does a lot to constantly reflect the filmmaker's one-man operation. br>Rough around the edges, but it is what it is. Audio Transfer Review: Audio is relatively no-frills, issued in 2.0 PCM stereo. Voice quality (which is 99% Jac Currie talking into the camera) is generally clear, and the occasional background tunes have a moderately larger and cleaner tonal quality. Nothing fancy, but it works, especially given how this was shot. Extras Review: Going with the brevity of the doc itself, the extras are a bit brief. The Director's Bio (01m:46s) is a scrolling text piece outlining Courtney Fathom Sell's background, and how he came to first pick up a camera. Defend New Orleans (01m:30s) is more scrolling text, this time from Jac Currie, explaining the origins of his underground clothing line and its role as a "celebration of cultural pride and preservation". Behind The Scenes Trivia (02m:37s) doles out a few more scrolling tidbits, such as the film's minuscule budget and the fact that Sell and Currie were both late to the film's premiere. An engaging Photo Gallery (03m:14s) of assorted stills completes the bonus material. I was really looking for proper credit somewhere to the musicians (who are acknowledged as being "personally connected with the subjects"), because the songs used throughout are really outstanding, and add quite a bit to the emotion. The doc's end credits aren't much help either. Too bad for them. The disc is cut into two chapters, one for the 50-minute doc, and one for a production title card. There are no subtitle options. 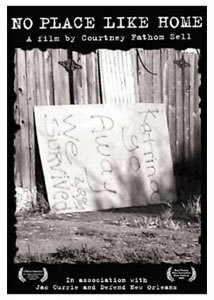 No Place Like Home is a curious little 2006 documentary from Courtney Fathom Sell�shot when he was 20�conceptually about the aftermath Hurricane Katrina but more so about how it permanently tilted the life of Jac Currie and how his underground Defend New Orleans clothing line came to mean so more than he could have imagined. Running under an hour and shot on a handheld Hi-8 camera, one could easily confuse this for a well-edited home movie, as it does meander in spots. But Currie is a likeable subject, and Courtney Fathom Sell at times seems to just let the camera roll on his daily life. Not your typical doc, but a recommendation if you like them left of center. It can be had for less than $15, and all proceeds go to Gulf Coast Restoration Funds. And put me down for one of those groovy mohawk skull T-shirts, Jac. Watch for my order. Black XL.